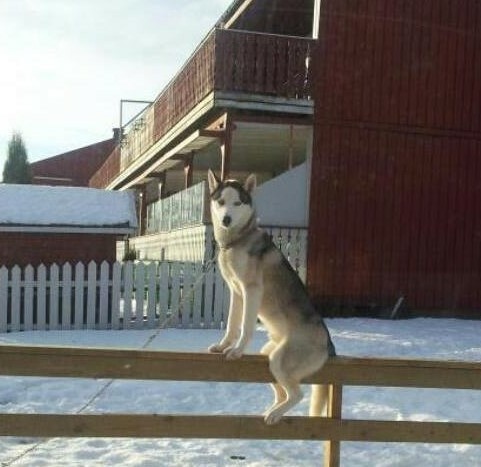 Sitting On The Fence? Ouch! Who owns this adorable dog??? The people in the brown house? Or the people on the other side of the fence? Is this dog coming home? Or are you running away? Sitting on the fence hurts! Lack of commitment to Jesus holds us back! Satan keeps us bound to it! From our position at the foot of the Cross! Are we too complacent to make an effort to get off the fence? Encourage others to get off the fence, too! So they can turn their back on hell! From our Lord and Savior. Into the arms of Jesus! And stay as far away from the fence as you can! Stop trying to run away! Real creative writing! Great post sis! Thank you, Bella…I’m honored to hear that from you the published writer…praying God gets His messages out there through me!! Haha!! I had a feeling you would use this furbaby!! This speaks loudly to me today as I jumped off the fence of lack of commitment and recommitted to my home church! :)) So glad God placed you in my life!!! Love you sister in Christ!!! Ox Ox! Yes, thanks for forwarding that to me…one because it’s a Siberian!! And two because it got me thinking and listening to God! Glad you got off the fence of “no commitment.” Years and years ago, I spent a lot of time in that land! Not anymore! I look forward to all our talks about Jesus, too!